Most wind turbines nowadays seems to take a very similar approach to aero-dynamics. The standard seems to be a three bladed propeller type driving a central shaft with or without a gearbox. However the Japanese among others have been looking at design and have worked on an air-flow focusing system which can reduce turbulence and noise, and increase dramatically the power to size ratio. They call it a Wind-Lens system. 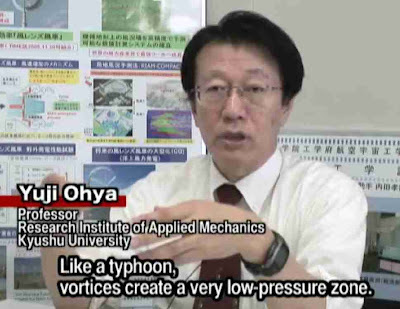 Basically it is a flanged tube around the turbine blades which focuses the airflow, increases the effective speed, and greatly reduced turbulence. It boosts the output greatly and Japanese research shows that boost in power generation can be up to five time that of a traditional design. Recent field tests indicate a 3 times boost over a regular turbine is not an unrealistic expectation. 1 Much more efficient, can run on half the wind speed of regular turbines. 2 Space saving. They produce more power for the size so take up less space. 3 Much quieter. Less turbulence means quieter operation. 4 Wider range of site options. These little turbines are good in urban settings. 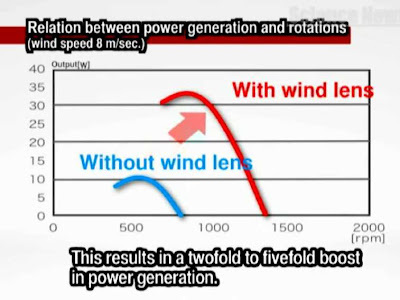 5 Produce usable power in lower speed winds. 6 Safer due to protective rim. Honeywell has a bash at the idea? 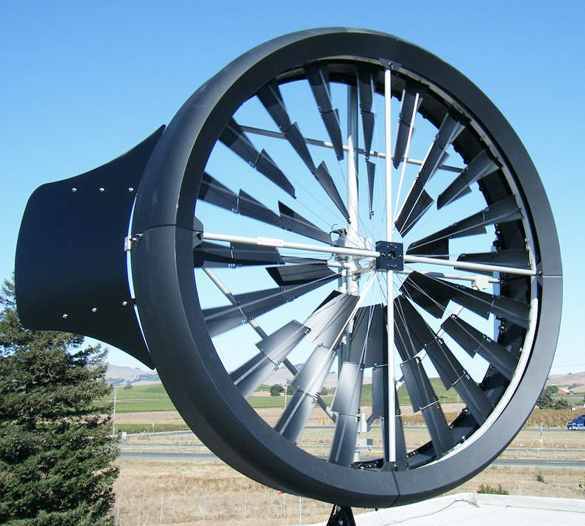 The Honeywell organisation have developed their own version of what looks like the wind-lens type of turbine. Their version has the generator magnets and coils around the outer rim of the turbine, rather than a center shaft driving a gearbox and generator.. 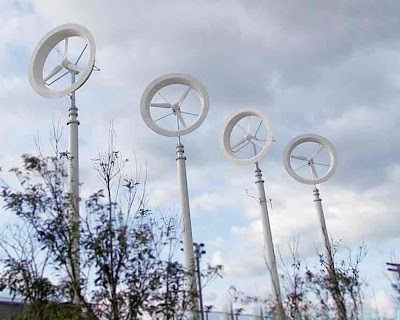 The turbine structure is very light and is reminiscent of a bicycle wheel with spokes to which are attached the turbine blades, I counted 20 blades in all. This type of annular rim generator design was seen described here on this blog before in the form of a tiny little turbine called “Turbine in a Box”. That little one turbine also looked somewhat like a very modern bicycle wheel. The design never seemed to have made it in the real world. There is nothing really new in the Honeywell design - they appear to have taken existing concepts, put them together and improved the overall design. It is an interesting synergy of design factors. The Honeywell wind turbine is 1.8 m in diameter, weighs 110 kgs and can produce up to 1500 kWh’s in a year depending on height, wind profiles etc. The Honeywell version of the wind lens, with rim generator, and multi-blade system can start-up in wind speed as low as 0.5 mph (0.2 m/s), Generates current at 3 mph (1.34 m/s) - less than half the speed of traditional designs, and have an auto shut off at 38 mph (17.0 m/s).